354 Responses to "Spoiler Page: A Forest Divided"
You already read PoS? Lucky! I have a feeling that Path of Stars is going to be a bittersweet book. Especially the end. At least Moth Flight’s vision will continue on the story! I’ve been thinking about how River (Ripple) has no mate, and Clear sky’s got 3 despite his attitude. I think River should have a mate. He’s nice and fair, and he definitely deserves one. If he had a mate, her name would be Feather Wing/Featherwing – a pale gray she-cat flecked with white with dark blue eyes. Brambleberry could even be descended from River and Featherwing! 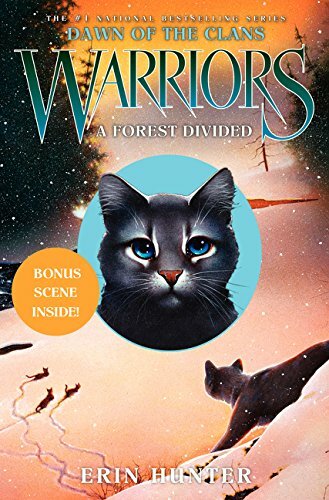 Anyways, this is a suggestion, and I hope you and the Erin Hunter team approve on it. I think she joined his camp. Was it Night? I wish it’s Star Flower carried off by an eagle, not Bright stream. Responding comment for Kate: What Tiny Branch’s Dew Petal’s and Flower Foot’s descriptions? They were never mentioned in PoS. Will it be mentioned in MFV?